If you’re like many families, you write and send letters to Santa with your children. Perhaps you started the tradition when your first child was born, or maybe you’re a little late to the game and are just starting now when your gaggle of kids is still young. No matter what your situation, it’s never too late to create and foster such a timeless tradition. This tradition is hardly anything new, though. It’s been going on in this country for more than a century! Whereas today’s letters from Santa stem from a jovial old soul who congratulates children on their good behavior all year long, the earliest Christmas correspondence took on more of a disciplinary feel. Saint Nicholas’ letters were designed to encourage children to behave, discussing their conduct over the previous year, whether mischievous or obedient, says Time. In 1871, cartoonist Thomas Nast drew a scene of Santa at his desk sorting mail into piles — one of the letters from naughty children’s parents and one with letters from good children’s parents (incidentally a much smaller stack than the former). Just a few years later, this same cartoonist created the first known image of a child mailing a letter addressed to the North Pole via the USPS while surrounded in a snowy scene. Nast’s drawings had solidified the image we all now have with the big man in the red suit and white beard. These hopeful images came at a time when the country really needed it — first appearing in Harper’s Weekly at the time of the Civil War. These pictures were also the first to tie in the U.S. Postal Service’s role in the Santa letter tradition. Not surprisingly, the Postal Service received an influx of letters around this time, all addressed to Santa. However, rather than embrace the start of this tradition, those letters were thought of as a child’s nuisance. The letters were either returned to sender or sent off to the Dead Letter Office. The Post Office even put out a statement in the Times that they did not believe in Santa Claus and that the Christmas season had become a bother for the DLO as it was saddled with a lot of extra work fielding those letters. Charities and philanthropists quickly shot back, saying their “lack of imagination to find a way to honor the children’s requests” was appalling. Attention to the matter grew throughout the years and in 1911, the Postmaster General decreed that all letters addressed to Santa Claus would be delivered to institutions and individuals for philanthropic use. The program limped along until the 1960s when Tonight Show host Johnny Carson began reading letters from needy children during his holiday shows. Interest in the Operation Santa program grew, but it wasn’t until 1989 that Santa Claus finally got his own zip code. Today, letters from Santa are commonplace, a burgeoning tradition among countless American families. In stark contrast to the Santa Claus of a century ago, often depicted as a disciplinarian with a switch in his hand and a stern warning for children to be good for their parents, today’s image is that of a caring, kind and jovial figure who rewards children for all the good they’ve done that year. As parents, we all want to make lasting impressions on our children about how loved they are. 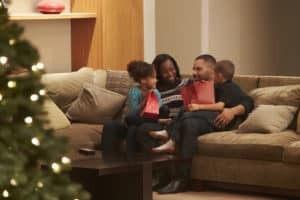 The Christmas season is a great time to create and spread those memories. That’s what we’re all about here at Letters From Santa: helping families like yours continue the tradition of this magical season. We offer customized letters from Santa to your children to keep the wonder alive during this magical time of year, with four custom backgrounds and four different choices for letter content. Personalize your letter with the child’s name, a gift request and why they have been good. Your children will get a custom envelope, personalized letter with signature and a custom hand stamp from Santa’s Village in the North Pole. Start your personalized letters from Santa today! 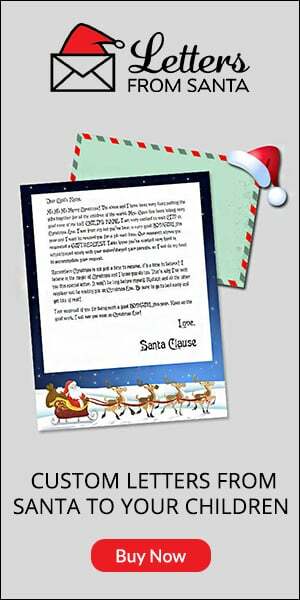 Start customizing your letter here to receive a letter from Santa in plenty of time. Remember, there are only two months left until Christmas!